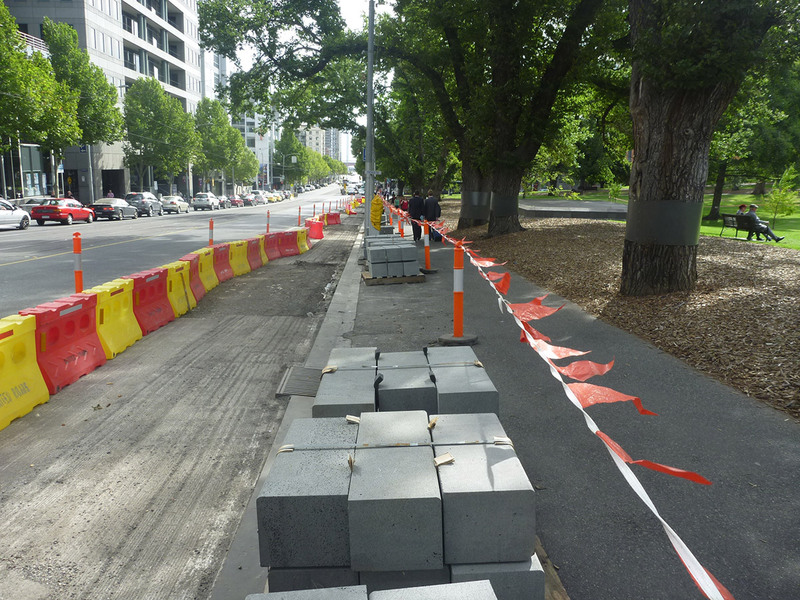 The La Trobe Street bicycle lane is an innovative project that combines water capture, urban greening and bicycle safety in a busy urban street. 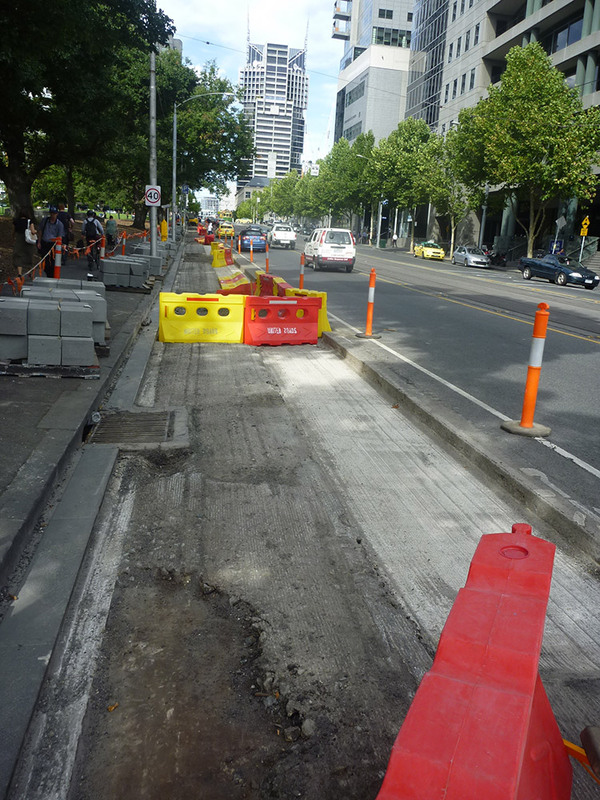 As part of our Bicycle Plan 2012-16, a separated bicycle lane was scheduled for construction along La Trobe Street. We took the opportunity to combine tree planting, passive irrigation and the separated bicycle lane into one piece of infrastructure. It was important to incorporate the tree planting during construction. Once the bike lane was built it would be difficult and expensive to apply water sensitive urban design. 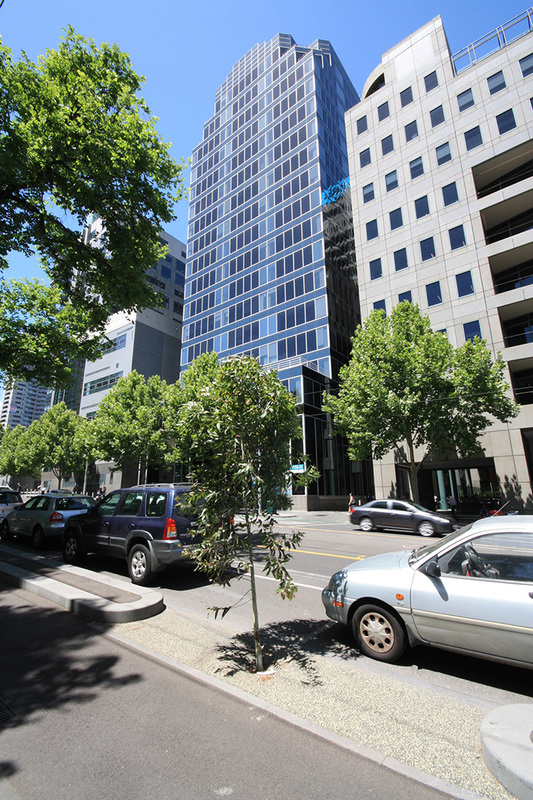 La Trobe Street is the northern boundary of the central city grid. Thermal imagery shows La Trobe Street is one of the hottest parts of the city, so increasing canopy cover was a priority. Adding canopy cover is an important part of our climate change adaptation program. Trees provide shade and cool the air, creating a cooler city. 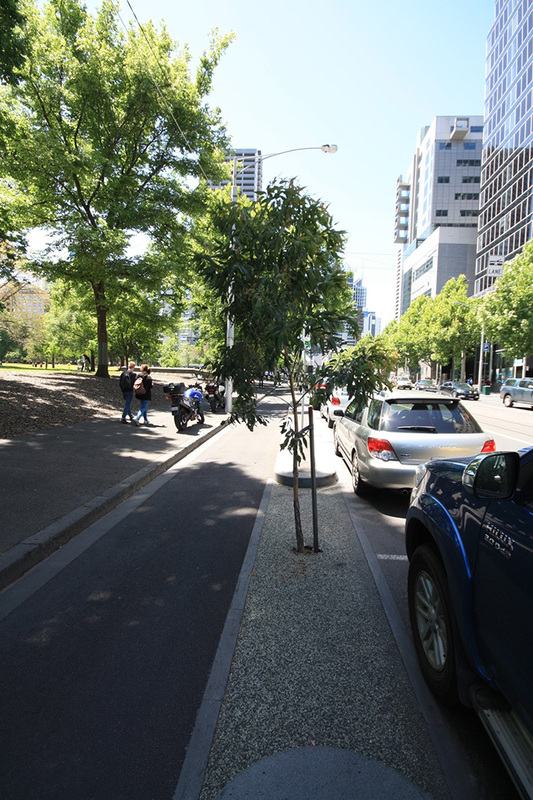 La Trobe Street is very wide, so we couldn’t create a canopy covering the street by planting trees in the footpaths. By planting trees in the bike lane median, we created broader canopy cover. 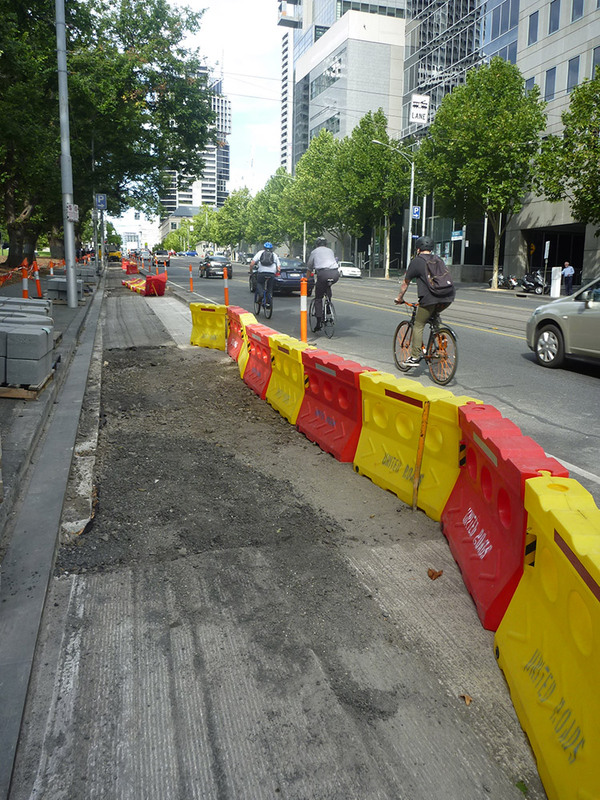 The La Trobe Street bicycle lane project received funding from the Victorian Government. What benefits has the bicycle lane project provided? Contributed to the implementation of our Total Watermark Strategy, Urban Forest Strategy, Bicycle Plan and Climate Change Adaptation Strategy. 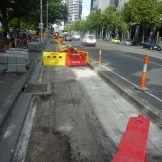 The separated bicycle lane was installed along the full length of La Trobe Street. 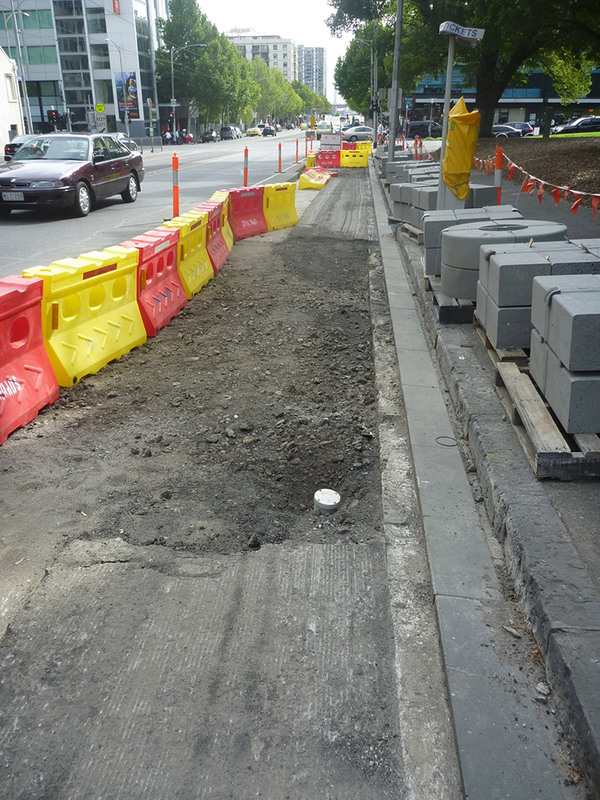 The stormwater capture and greening was trialled on the section between King Street and William Street. 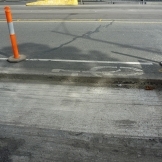 The new bicycle lane is separated from vehicle traffic by a thin median strip. This median includes specially designed tree plots that capture stormwater as it runs off the road surface. This provides passive irrigation for the new trees. Structural soil is used in the tree plots to ensure that the water is able to filter down to the root system. 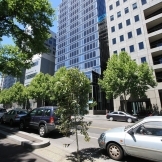 Combining many outcomes into one project has been a cost effective way to deliver on the objectives set out in several City of Melbourne strategies. The trees and water sensitive urban design components of the median project cost a total of $110,000. 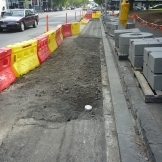 Using La Trobe Street as a test case for an innovative style separated bike lanes was an important element of the business case for this project. Innovation played a key role in the successful bid for funding. 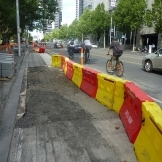 The City of Melbourne designed and delivered this project. It received funding from the Victorian Government. 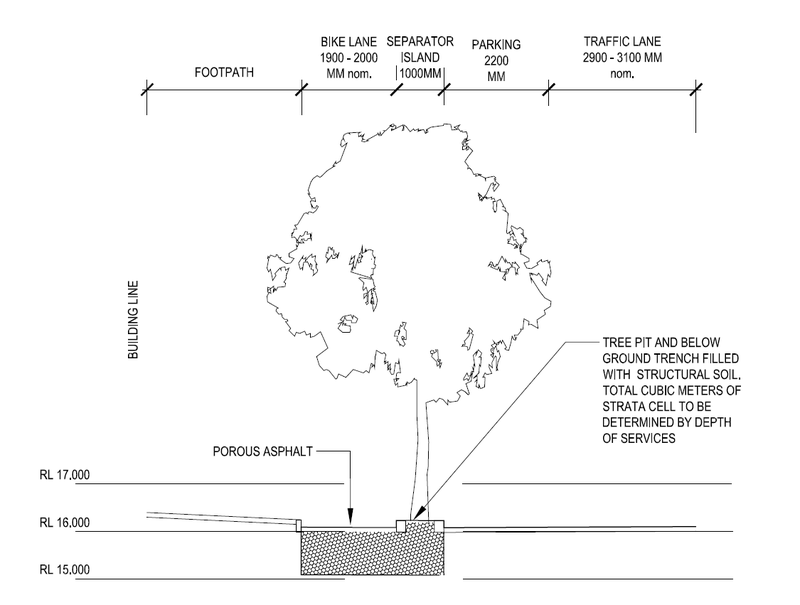 Concept designs were developed showing the proposed separated bike lane with permeable paving and trees in the median. The designs were used for stakeholder consultations and traffic modelling. The design involved narrowing the roadway and shifting the location of car parks, so a traffic study was carried out to understand the impact on local traffic. Although VicRoads modelling showed some minor impacts on vehicle traffic, this was offset by the positive impact on bicycle traffic. Detailed designs were created based on stakeholder engagement, road safety study and traffic study outcomes. We needed to increase the canopy cover in La Trobe Street as thermal imagery showed it was a very hot area. The street is wide, so we couldn’t create a canopy covering the street width by planting trees in the footpaths. 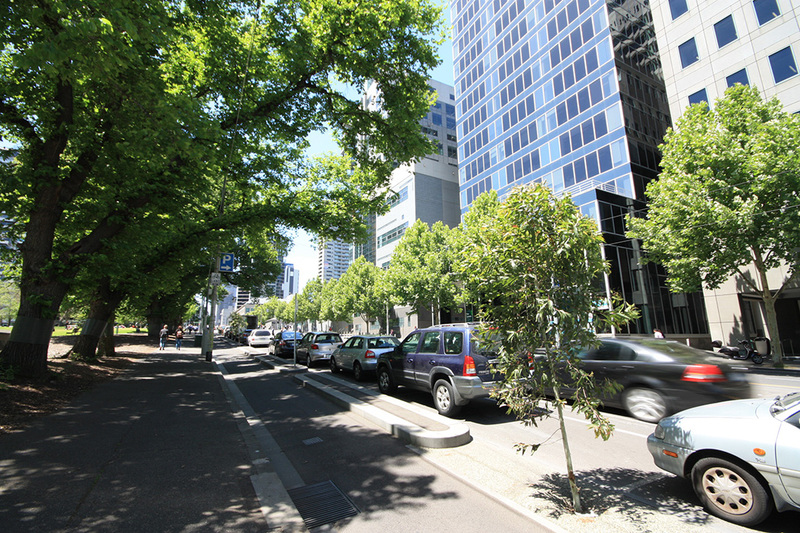 By planting trees in the bike lane median, we created broader canopy cover. We combined different streetscape improvements into one project, rather than implementing them separately. The purpose of the project was twofold: to create bike lanes that intercept stormwater and to house trees in the areas separating bikes and vehicles. The challenge was to design a space that maximised function without compromising functionality. 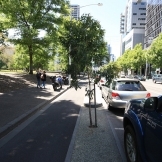 Originally, our intention was to incorporate trees into the bike lane medians for the entire length of La Trobe Street. However the presence of driveways, fire hydrants and other existing infrastructure limited the number of trees we could plant. 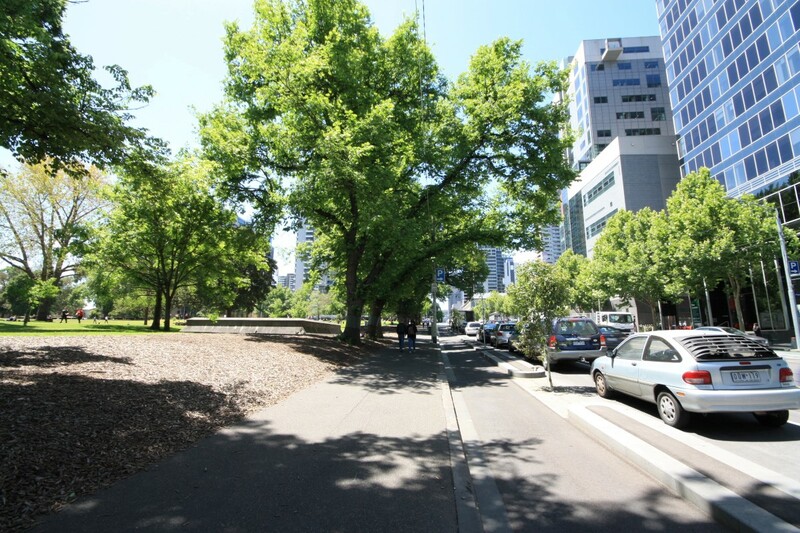 The only continuous row of trees we could incorporate was on the section between King Street and William Street alongside Flagstaff Gardens. We planted lemon scented gums as they grow well in open spaces. 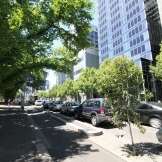 The trees were planted adjacent to Flagstaff Gardens, with good solar access. They should grow to have large, healthy canopies. 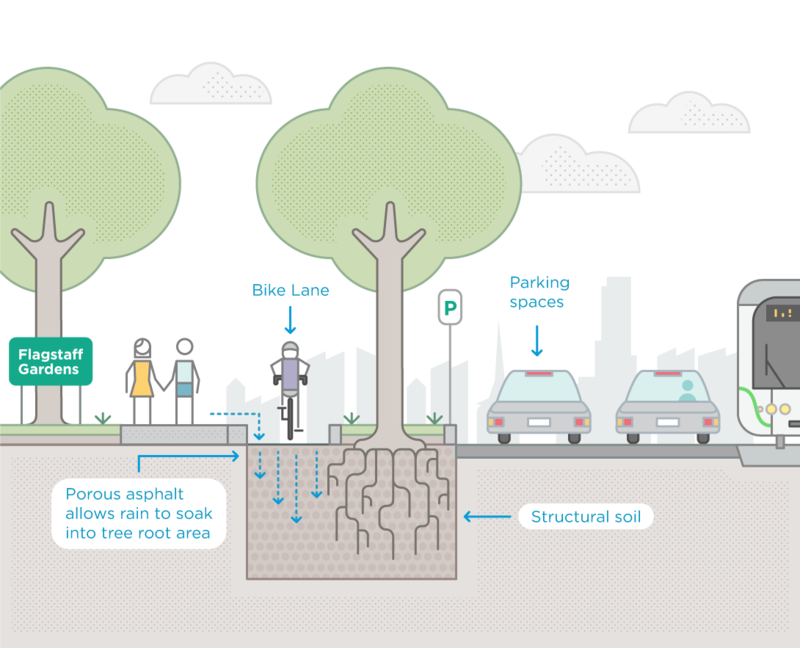 Purpose: to provide good growing conditions for the root systems of the new trees in the bike lane median, while also supporting bike and car traffic. Composition: The structural soil is a thoroughly combined mix of aggregate and filler soil at a ratio of 5:1 by weight. Purpose: to allow water runoff from La Trobe Street to soak through to the structural soil and tree root systems. 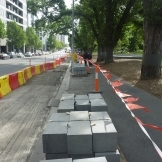 Location: the porous aggregate is laid around the base of the trees and runs between the concrete bike lane separator strips. 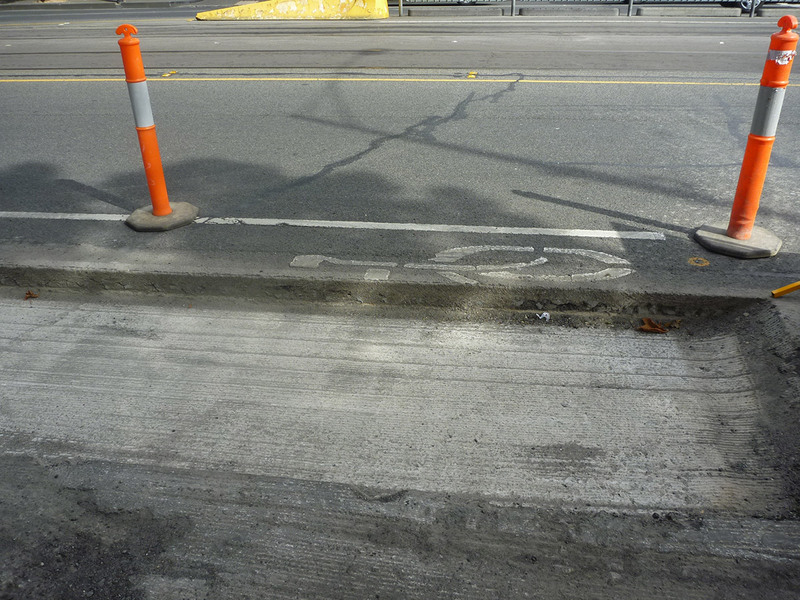 The bike lane median requires minimal maintenance. The trees are irrigated with stormwater runoff from the road and do not usually require manual irrigation. We monitor the health of the trees and manual irrigation can be provided in times of drought, particularly while the trees are young. The health of the trees is the best indicator that the water sensitive urban design median is functioning well. Tree health is monitored regularly by City of Melbourne contractors. Passive irrigation in this park will make the trees more resilient in a changing climate. WSUD is an important part of water cycle management. It is an approach that integrates whole of water cycle management into urban planning and design.